While the phrase, “Who cooks for you? Who cooks for you?” is not heard much inside the Inn on Mill Creek B&B (answer already well-known: Innkeeper Dave! ), you may hear it outside, in the trees of Pisgah National Forest surrounding the Inn. And just who is asking that question? None other than the Barred Owl, our October 2014 bird in our 12 Months of Birding at the Inn blog series. 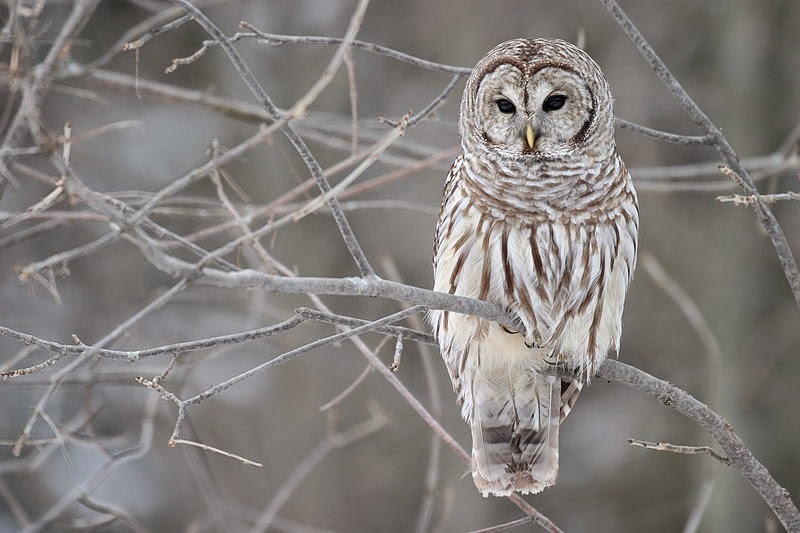 And if you hear that call while you’re staying at the Inn on Mill Creek, it’s likely that it’s coming from a Barred Owl who’s a “local” — one that has lived its whole life near the Inn. Barred Owls are not migratory birds; one study of 158 banded owls showed that none moved more than six miles away. Barred Owls can also live a long life: the oldest documented Barred Owl was 24 years old! The Barred Owl’s diet consist of small animals, such as squirrels, voles (if only they would get all the voles who eat our tulips!! ), rabbits, mice and chipmunks, as well as small reptiles, fish and crayfish. The Barred Owl also has its own predator — the Great Horned Owl.